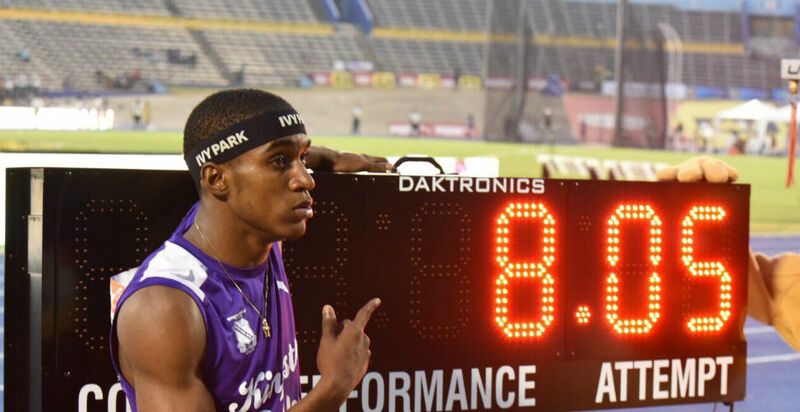 After breaking the old mark of 7.87m – set by Leon Gordon in 1993 – in round two of the event with a jump of 7.95m, Pinnock returned to produce an exceptional effort of 8.05m in the third round to improve his previous record. In unsuitable conditions for jumping, Pinnock cut the sand much further than his previous mark, but the official initially held up a red flag, much to the disappointment of the jumper himself and the KC supporters. However, the attention was quickly switched to the scoreboard, as the official smiled and changed to the white flag. An emotional Pinnock, who had tears in his eyes, waited next to his dad for the mark to be posted. In the end, it turned out to be a gratifying wait. The mark is also a world leading mark by an Under-20 athlete this year. 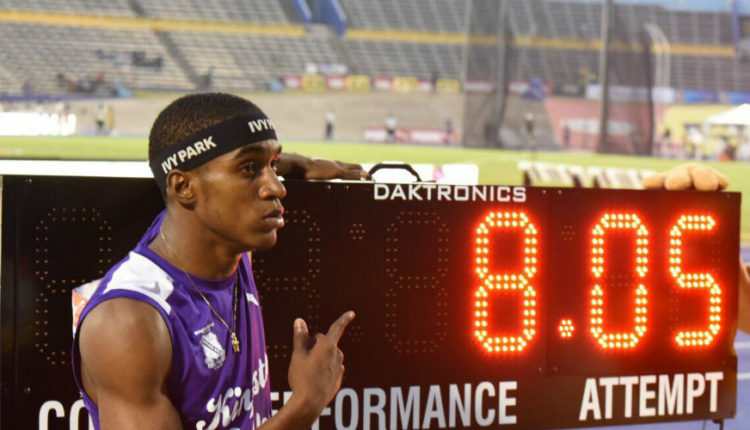 It was a 1-2 finish for Kingston College in the event as Shaquille Lowe leaped 7.61m for second place, while Micheal Buch of St. Elizabeth Technical (STETHS) grabbed third with a mark of 7.26m. Earlier, Jordan Turner and Luke Brown picked up a 1-2 finish in the class two boys’ long jump for Calabar, but the champions did not pick up a single point in class one, after their lone competitor Lamar Reid failed to register a mark in the final. Kingston College collected 11 points from the class two long jump. Meanwhile, Shamella Donaldson of Rusea’s won the Class 1 girls discus final with a mark of 50.70m. Adrienne Adams of Excelsior finished second in 47.32m and Marie Forbes of Vere Technical did 46.94m for third place. Sherene Williams of STETHS took the class two girls shot put with a throw of 13.94m. Taking second place was Aaliyah White of Wolmer’s with 13.60m, while Monifa Edward of Edwin Allen collected the bronze medal with a mark of 13.36m.